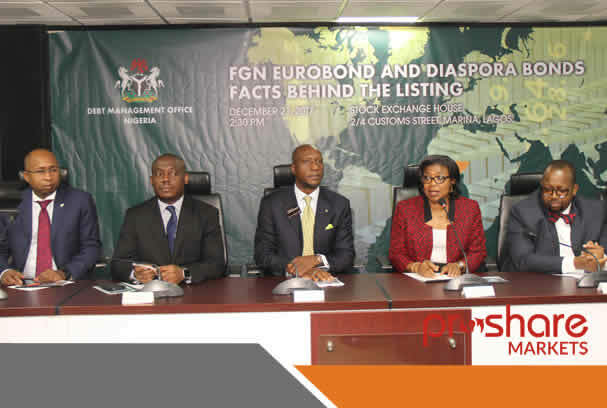 As part of its mandate of managing Nigeria’s public debt, which also includes borrowing the Debt Management Office today listed the FGN Diaspora Bond of $300ml and the Eurobond 2-tranche of about $3bl, totalling about $3.3bl. After the closing gong ceremony at the floor of the Nigeria stock exchange, which was the platform for listing, the Director General of the Debt Management Office Ms Pat Oniha engaged market stakeholders on the “Facts Behind the Listing”. In her presentation, Ms Oniha noted that the $3bl Eurobond raised will be used to finance infrastructure projects of the Federal Government, that is geared towards transforming the nation’s socio-economic landscape. With a 30 year tenure and coupon if 7.65%, the DMO DG asserted that the $3bl FGN Eurobond was the largest ever raised from Sub-Saharan Africa, and the oversubscription of the bond showed that investors still had confidence in the Nigerian economy. For the $300ml Diaspora Bond, Oniha said it was different because it provided various instruments that suit the needs of diaspora investors. According to her “Through the Diaspora Bond, Nigeria now has securities that have been registered with the United States Securities and Exchange Commission”. She assured the capital market players that the DMO was guided by two acts the Fiscal Responsibility Act and the Debt Management Office Act, to ensure it delivers on its mandate and does not lead Nigeria into any phase of reckless borrowing. Out of the $3bl Eurobond $2.5bl will go to financing the capital expenditure component of the 2017 Federal Government Budget, which is aggressively exploring ways of addressing Nigeria’s infrastructure deficit. Giving his opening remarks the CEO of the Nigeria stock exchange Mr Oscar Onyema lauded the DMO Nigeria to providing instruments like the FGN Savings Bond, Diaspora Bonds, Eurobond amongst others for the Debt market. He assured the DMO that the NSE will remain a veritable platform that will support viable Debt instruments, aimed at boosting Nigeria’s economic growth.